Set amidst a well preserved garden, each bungalow is complete with a fan, a mosquito net and a private bathroom with a shower. At the terrace, guests can enjoy rearing at the seating, have a swing in the provided hammock or admire sea and garden views. Offering a sandy beach area and water sport facilities, Kalume Kradan Village also boasts a restaurant, a relaxing massage service and a luscious tropical garden. This lodge provides eco-friendly bungalows comprised of intricate hardwood or of bamboo walls and floorings. During the stay, guests have an access to free WiFi in all areas. Set amidst a well preserved garden, each bungalow is complete with a fan, a mosquito net and a private bathroom with a shower. At the terrace, guests can enjoy rearing at the seating, have a swing in the provided hammock or admire sea and garden views. 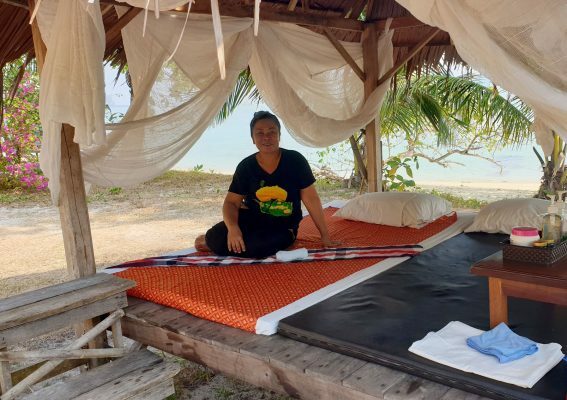 Apart from snorkeling, canoeing and fishing, this pet-friendly accommodation also provides a library and barbecue facilities. Trang Airport is located 45 km away from the property. A range of Thai and western cuisines are served at the in-house restaurant. Delight beverages and pleasant music are available at the bar. Don't miss attractions enjoy the peace and tranquility that only this island one can offer you.